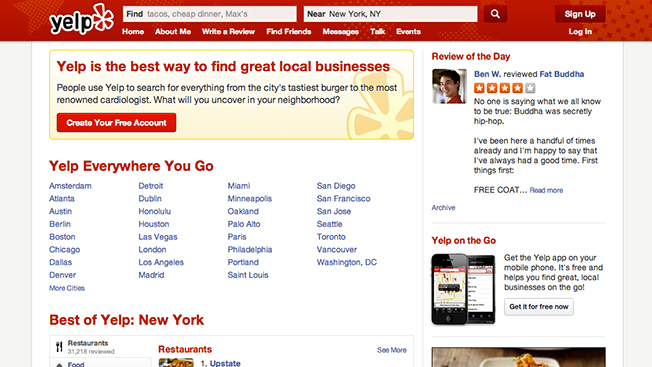 Yelp Inc. and its executives were accused of selling $81 million of artificially-inflated stock while "deceiving shareholders about the quality of consumer reviews on its website," Reuters reported yesterday. The class-action shareholder lawsuit, which was filed in the U.S. District Court in San Francisco on Wednesday, alleges that Yelp's share price reached artificially inflated levels of more than $98 earlier this year due to misrepresentations by the company about its true condition. The lawsuit claims that "Reviews, including anonymous reviews, appearing on the company's website were not all authentic 'firsthand' reviews, but instead included fraudulent reviews by reviewers who did not have first-hand experience with the business." Yelp CEO Jeremy Stoppelman, the lawsuit alleges, sold over 132,000 shares of his stock in the company, for proceeds of over $2.5 million, before media reports about Yelp's problematic consumer reviews led to a stock drop to under $66 a share in April. In a statement, Yelp refuted the allegations as "without merit" and vowed to "vigorously contest them."